Review: "Stevens, Matt: Lucid" - Sea of Tranquility - The Web Destination for Progressive Music! Matt Stevens is a British guitarist who plays in the instrumental band Fierce and The Dead but has also released a few solo albums. His latest outing is titled Lucid, and it's his first release on the Esoteric/Cherry Red label. Helping out on Lucid are drummer Pat Mastelotto (King Crimson), Bass guitarists Lorenzo Feliciati (Naked Truth), Charlie Cawood (Knifeworld) and Kev Feazey, keyboard players Jem Godfrey (Frost) and Emmett Elvin (Chrome Hoof / Guapo), violinist Chrissie Caulfield (Helicopter Quartet / Crippled Black Phoenix), vibe player Jon Hart and Nicholas Wyatt Duke (Trojan Horse) who contributes spoken word. The album took three years to complete, and you can really tell that Stevens put a lot of love into it. A well rounded album, Lucid has a little bit of something for everyone. Fans of King Crimson's mid '70s as well as their more modern material will love the herky jerky, complex prog numbers like "The Ascent" and "Oxymoron", each one filled with acrobatic guitar work, intricate bass lines and busy drumming. There are also the more atmospheric mood setters such as "Coulrophobia", "Flow", and "The Other Side", as well as the upbeat jazz-fusion styled pieces like the title track and metallic "The Bridge". Through it all, Stevens shows his mastery of the electric as well as acoustic guitar, wowing the listener with dissonant, jagged solos that border on heavy metal, and calming with lush acoustic tones and passages. "A Boy", "Street and Circus", and "KEA" are simply lovely pieces. There are plenty of instrumental guitar based albums released each year that are all flash and no substance, but Lucid certainly isn't one of them. Matt Stevens is a talent you should definitely check out if you haven't already. 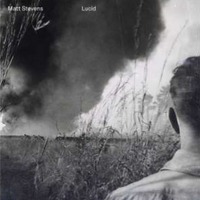 Matt Stevens is a UK guitarist whom I became familiar with upon hearing his last album Relic which I enjoyed very much. He is a unique and innovative player with a sound very much his own. On his latest album Lucid he has brought some fine players along for the ride like drummer Pat Mastelotto (King Crimson), keyboardists Jem Godfrey (Frost) and Emmett Elvin (Chrome Hoof / Guapo) and bassists Lorenzo Feliciati (Naked Truth) and Charlie Cawood (Knifeworld). This is guitar centered music that touches on a variety of styles like post rock, acoustic rock and of course progressive rock, all played with an emotive fervor that bursts forth through the speakers. Dare I say there is even a punk rock attitude on display on some of these songs. Take the album's first rack "Oxymoron". This is a post rock gem played with an abandoned fury that was so vital to the punk rock sound all those years ago. I love the layered wall of sound from Steven's guitar and his riff progressions are very cool and quite compelling. "Flow" is just programming and guitar featuring Stevens distinctive picking while "Unsettled" is an adventurous tune with just guitar, bass and drums. I really dig the deep fuzzy bass tones and Steven's chords which chime, chop and distort their way through the soundscape. "Street And Circus" has an acoustic rhythm reminding me of Animals era Pink Floyd but my favourite track is the twelve minute epic "The Bridge", clearly the album's most adventurous piece. Steven's dense guitar chords have a post rock flair and he uses layering to great effect. Moodier sections convey Steven's clean clear tones and some cool Floyd-like effects. The album ends with the pretty acoustic piece "A Boy". Often instrumental rock can be lacking but with Lucid this is clearly not the case. Stevens has made an adventurous album and his guitar playing absolutely shines throughout. I for one cannot wait to hear what he releases next.